Alain and Elizabeth were wonderful and caring hosts. This was an exquisitely located restored farmhouse 10 minutes outside a lovely town and beautifully set among olive and grape vine fields. 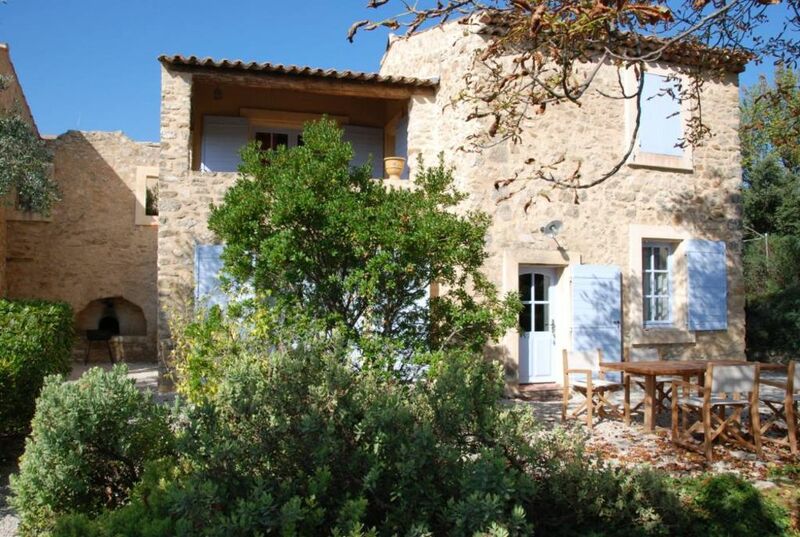 Our spacious Gite was a welcome sanctuary at the end of every day of touring and well located in the Luberon to be able to visit most places within not more than an hours drive in every direction. Our only regret was that we were not able to spend more time there and, if we were to return, we would budget in more time for lounging and eating at home and enjoying the lovely swimming pool with it's incredible setting. A truly beautiful place, wonderful hosts, great firm bed with wafting jasmine everywhere. It doesn't get any better than here. When we left for the easter part of Provence we missed this place terribly. The place was immaculate and beautifully renovated. Alain and Elizabeth were always helpful with travel and sightseeing recommendations and especially with dining recommendations for hidden local restaurants. The town of Tour D'Aigue nearby is a gem and a great spot to pick up Boulangerie , fromage and patisserie. Would go back in a second! Paradise and luxury in one! We spent a wonderful week in this house with our two daughters. The view and setting of this beautiful Mas is incredible. The house had everything one could want and more. The decor was lovely and we were so happy to be able to borrow the 2 mountain bikes. The pool was our daily refuge and was just beautiful. We felt so spoiled. Our hosts were a lovely couple - friendly and funny. We had our privacy but they were happy to help when we needed something. I would recommend this house to anyone looking for calm and beauty. The towns are close enough to visit and shop but we were always happy to be back to enjoy the pool, a cocktail and the sunset. We hope to go again! Eine paradiesische, wunderbar ruhige und sehr gepflegte Anlage mit sehr netten und dezenten Gastgebern in unglaublich schöner Umgebung. Wir haben uns bestens erholt. Das Ferienhaus liegt sehr schön und ruhig auf einem großen Anwesen mit altem Baumbestand. Die leichte Hanglage ermöglicht einen schönen Blick auf die Felder mit Olivenbäumen und Weinreben. Die Einrichtung ist geschmackvoll und typisch mediterran. Die Küche ist sehr gut ausgestattet, das Wohnzimmer ist groß und hat sogar einen Kamin. In der oberen Etage befinden sich die beiden Schlafzimmer, von denen man auf den Balkon kommt. Der Balkon ist mit Loungemöbeln ausgestattet und man hat von hier einen tollen Blick auf die Landschaft. Ebenfalls oben befindet sich das Badezimmer. Das WC hat eine separate und abschließbare Tür. Das Haus war sehr sauber und ist gut ausgestattet. Im Außenbereich befinden sich schöne Gartenmöbel, ein großer Weber-Grill und Liegestühle. Der Pool ist sehr groß und sauber. Die Wassertemperatur 27 Grad. Liegesfühle sind ausreichend vorhanden. Wir waren begeistert von dem gepflegten Anwesen und haben uns so richtig wohl gefühlt. Die Besitzer (Fam. Wils) sind wirklich sehr nett! Ein wunderschönes großes Grundstück in mitten der Natur des Luberon. Das sehr geräumige Haus ist mit allen Annehmlichkeiten versehen, die man so braucht. Man kann wählen zwischen einer Terrasse im 1. OG und der vor dem Haus, beide mit schönem Blick auf die umliegenden Weinberge und Felder. Der Pool ist riesig und durch die Abdeckung bei Nichtbenutzung sehr sauber. Die hochwertige Küchenausstattung lässt keine Wünsche offen, das gleiche gilt für die Bequemlichkeit der Betten. Les 2 semaines passées dans le Luberon ont été très agréables pour toute la famille. La villa est magnifique (encore plus belle que sur les photos) et très bien aménagée (rien ne manque...). Très agréable d'arriver après plusieurs heures de route dans une villa où tout est fait pour vous accueillir: boissons fraîches au frigo, lits faits, serviettes à disposition,...et piscine à 30°C. Le domaine est bien entretenu et la piscine est splendide. Le calme et le charme du lieu ainsi que la discrétion de Mr. et Mme Wils vous amène à vous sentir chez vous, un séjour "comme à la maison". La région est magnifique et les activités/visites/marchés autour de la propriété sont nombreux et détaillés dans des prospectus mis à disposition. (Text automatically translated) The A51 (exit Pertuis) motorway. Go to La Tour d'Aigues, then take the D135. The place called "The Turquerie" is the height before branching Mirabeau / Grambois. (Text automatically translated) The region (Aix en Provence, La Roque d'Anthéron, Lourmarin, ...) is known for its cultural events. Sports fans in the natural environment (golf, canoê, horse riding, cycling, ..) will be delighted with the varied landscapes they traverse. The owners can also give you the benefit of their local gastronomic experiences.